Prepare a scrumptious Veggie Pizza that everyone will love! 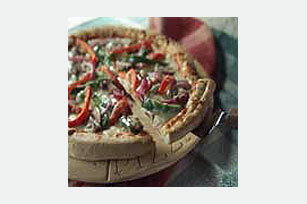 Top with pizza sauce, green peppers and onions for magnificently meatless pizza. Place crust on baking sheet; spread with pizza sauce. Top with vegetables and cheese. Bake 12 to 14 min. or until cheese is melted and crust is golden brown.